All the characters in Peanuts will be on the big screen for the first time in 3D animation to celebrate the 65th birthday of the most famous beagle in the world, Snoopy. Combining classical animation features with humorous story lines, it will sure make waves again! Apacer cooperates with the movie exclusively to release limited official authorized merchandise. With Snoopy and his good friend Woodstock as our main characters, we have developed unique digital products by combining them with Apacer’s best selling AH333 USB flash drive, B510/B513 power bank and AC233 portable hard drive. These are classical collections Snoopy fans can’t afford to miss! All limited edition “Apacer X Snoopy” merchandise will be released on November 1st, and the mysterious fan campaign with abundant awards will also be announced. Please stay tuned in case you miss them! Soar in the sky with Flying Ace Snoopy! In the fantasy world of Snoopy’s doghouse, the most thrilling one is his battles with German ace pilot, the Red Baron. 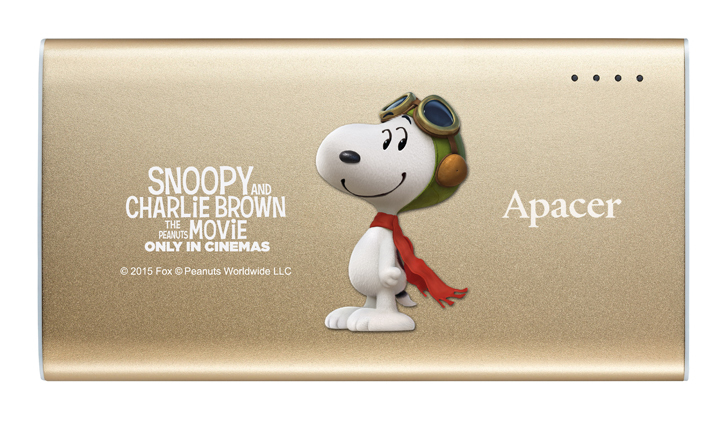 Now Apacer’s B510 power bank has “flying ace” Snoopy on it and will be your best partner to roam about in the digital world! The cover of Apacer B510 is made out of boutique quality aluminum alloy and has the quantity of 5000 mAH, which is enough to charge ordinary smart phones twice. Its appearance is extremely slim, with only 1.2 cm. wide and weighs only 170 g. It is light, easy, and is the best consumer electronic device to take with you. “Although I don’t know what you are saying, I’ll always be behind you.” The friendship between Snoopy and Woodstock always warms our hearts. With their generous smiles and wholehearted hugs, that is what friends for a lifetime should be like! 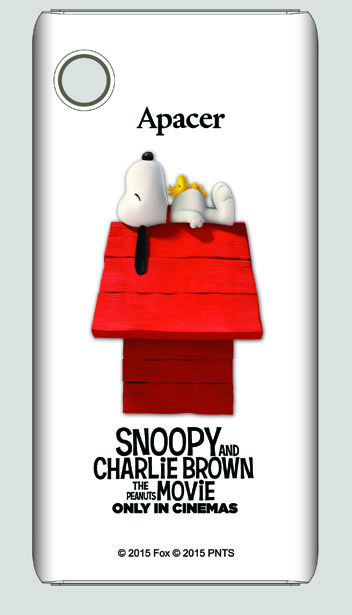 Now, the friendship of Snoopy and Woodstock can always accompany you. Limited “Snoopy and Woodstock” AC233Portable Hard Drive selects their hugging scene as its theme and is the best choice to share great memories with your friends. With “high-speed, slim, streamlining and fashionable” as it’s designing concept, it utilizes the high-speed communication interface of USB 3.0 and added with the unique arched design of “Streamline Shark” to emphasize the sense of speed. The generous smart power management function not only saves power, but also prolongs the life of the hard drive! The roof of the red doghouse is the secret base where Snoopy and his dear friend Woodstock talk, have fun and rest. 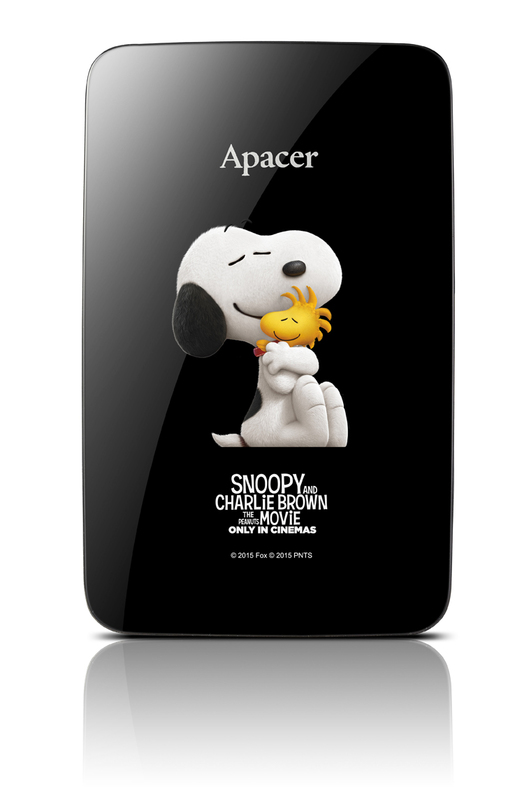 Apacer B513 Power Bank presents the cute image of Snoopy and Woodstock sleeping on the roof of the doghouse exclusively. Snoopy fans should not miss this! Apacer B513 Power Bank is a dynamic and sporty digital accessory that combines unique circular fastener with LED signals, in which it enables users to check the power status easily, and can be used with carabiner to hang it on backpacks, stands or anything else, so that you can enjoy endless power supply at any time. Its large quantity of 6000 mAH is enough to charge the smart phone twice, allowing the users to have all day carefree mobile life. The cutest and most loyal beagle in the world can now accompany you every day! The limited “Perfect Partner Snoopy” Apacer AH333 USB Flash Drive has the perfect coordination of Snoopy with ivory white appearance and red crystal circular decorations. It makes one wanting to carry it along and show it off to other people. This is the collection that Snoopy fans can’t dare to miss. With the pebble-like circular body of AH333 USB Flash Drive, it gives the users the perfect experience of considerate and hand-fitting. It is convenient to carry due to its small size and light weight. By providing the storage selection from 8 GB to 64 GB, it can satisfy to demand for storing massive data. ”Apacer X Snoopy” Launching Campaign and Limited Channel Version will also be announced. Please Stay Tuned! To celebrate the first time that Snoopy has appeared on the big screen as 3D animation in 65 years, Apacer will launch a series of campaigns, including the “Exclusive Channel Limited Version” merchandise that will be announced recently by cooperating with Tsann Kuen, and exclusive campaigns on Apacer’s official Facebook fan page. All this information will be officially announced on Apacer’s official Facebook fan page. Please stay tuned and don’t miss any important announcements!